Peritonsillar abscess management on the Emergency Department: conservative or surgical approach? Peritonsillar abscess (PTA) is a collection of pus between the capsule of the palatine tonsil and the pharyngeal muscles. It is the most common deep neck space infection, both in children (49%) and adults (30%), representing the most frequent indication for non-elective otolaryngological hospital admissions. According to the Agency of Healthcare Research and Quality, the estimated annual incidence in 2013 was 19.07 per 100,000, accounting for approximately 60,000 visits to the emergency department (ED) from which 22% were admitted to the hospital. How has it been managed? Despite being relatively common and having the potential for severe morbidity and rare mortality, there is a wide practice variation among physicians and geographical locations regarding its initial management on the ED. 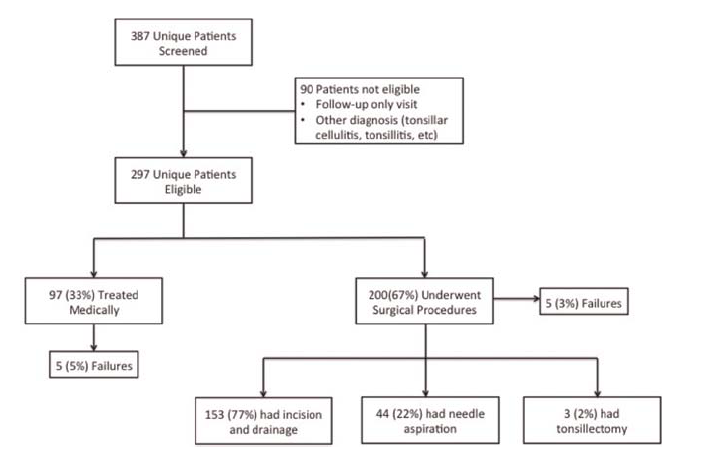 The current literature commonly recommends surgical intervention, including needle aspiration or incision and drainage, for PTAs with success rates near 90%. However, some small studies brought novel evidence that antibiotic administration associated with steroids, pain control, and hydration can be as effective as surgical management as first-line treatment in selected in patients with mild to moderate symptoms in limited resource settings. Among these small studies we highlight Lamkin and Portt, who reported a 4.1% failure rate in 98 Native American patients initially treated with antibiotics and high-dose steroids for PTA; and also Wang et al., that analyzed a national dataset from Taiwan and reported a 4.5% failure rate within 30 days among more than 11,000 PTA patients with initial medical management. 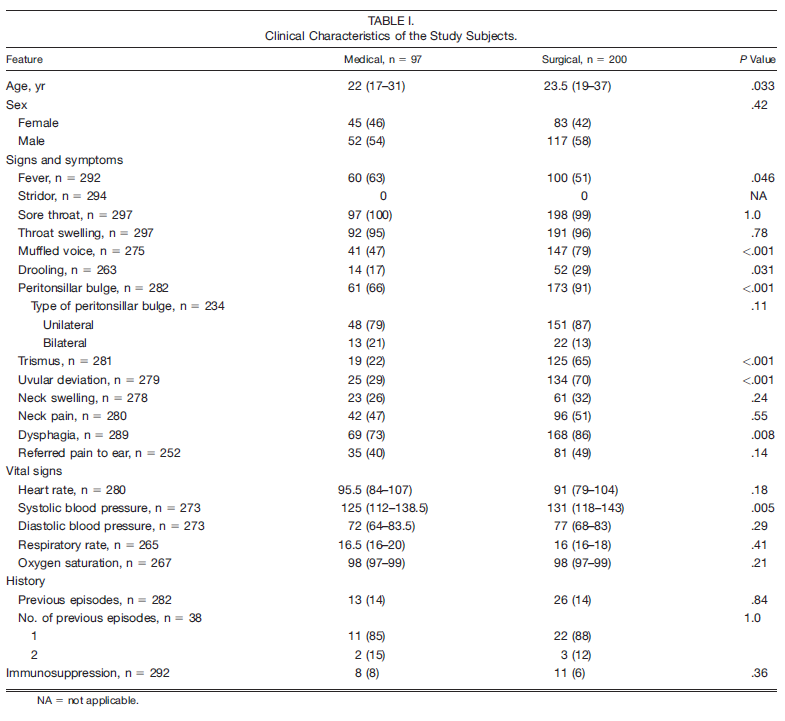 Given the lack of strong evidence and attempting to better elucidate this matter, we looked at our own data: all patients presenting PTA from January 2010 to December 2014 were evaluated regarding clinical characteristics and outcomes of medical management versus surgical intervention for initial treatment. One-third of the patients presenting with PTA at our institution during study period were treated medically (Fig 1). These patients had less-severe symptoms and smaller abscesses (Table 1). Overall, there was no significant difference in failure rates between patients with initial medical management versus initial surgical management (5% vs. 3%, P=.30). Thus, our findings support previous studies that initial medical management should be considered in certain scenarios. Noninvasive approach can be considered as initial management of patients with less-advanced symptoms or smaller abscesses without compromising outcome and it can be an alternative first-line treatment in resource-limited or austere environments or in populations where surgical approach can be challenging or unfeasible, such as small children or when it is the patient’s preference. Patients with drooling, trismus, muffled voice, and uvular deviation or large abscess size may benefit from surgical drainage. It is important to highlight that our study is also small and had several limitations inherent to retrospective nature (e.g. bias, confounders, and report variations). That said, allied with our findings, it supports the need for further research to compare medical versus surgical management to identify which populations will benefit the most with either approach. Meanwhile, this matter will remain controversial, and practice will be guided mainly by clinical judgment of the initial presentation of PTA. Souza DL, Cabrera D, Gilani WI, Campbell RL, Carlson ML, Lohse CM, Bellolio MF. Comparison of medical versus surgical management of peritonsillar abscess: A retrospective observational study. Laryngoscope. 2016 Jul;126(7):1529-34. doi: 10.1002/lary.25960. Epub 2016 Mar 24. PubMed PMID: 27010228. Agency for Healthcare Research and Quality. Available at: http://hcupnet.ahrq.gov. Accessed on October 9, 2016. Lamkin RH, Portt J. 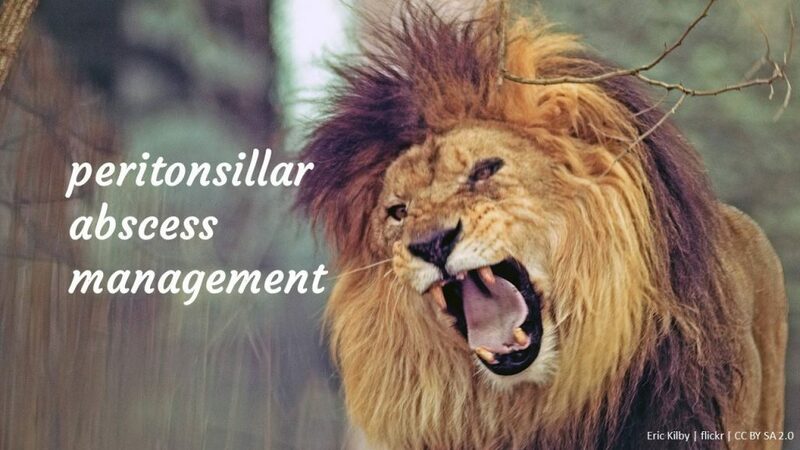 An outpatient medical treatment protocol for peritonsillar abscess. Ear Nose Throat J 2006;85:658, 660. Wang YP, Wang MC, Lin HC, Chou P. The impact of prior tonsillitis and treatment modality on the recurrence of peritonsillar abscess: a nationwide cohort study. PLoS One 2014;9:e109887.